I saw this recipe on Facebook and I knew that I had to make it and share it before St. Patrick’s Day. On Facebook it was shown as a pudding shot, but I decided to serve as a dessert. I remember as I got older on special occasions my mom would buy creme de menthe and ice cream and make Grasshopper drinks for our family. We always thought they were delicious and to this day I love a good Grasshopper; I love the minty flavor. Well this recipe reminds me of those Grasshoppers of long ago. Instead of putting them in a shot glass, I filled small glasses topped them with a little sweetened whip cream and chopped chocolate and served them as a refreshing dessert. 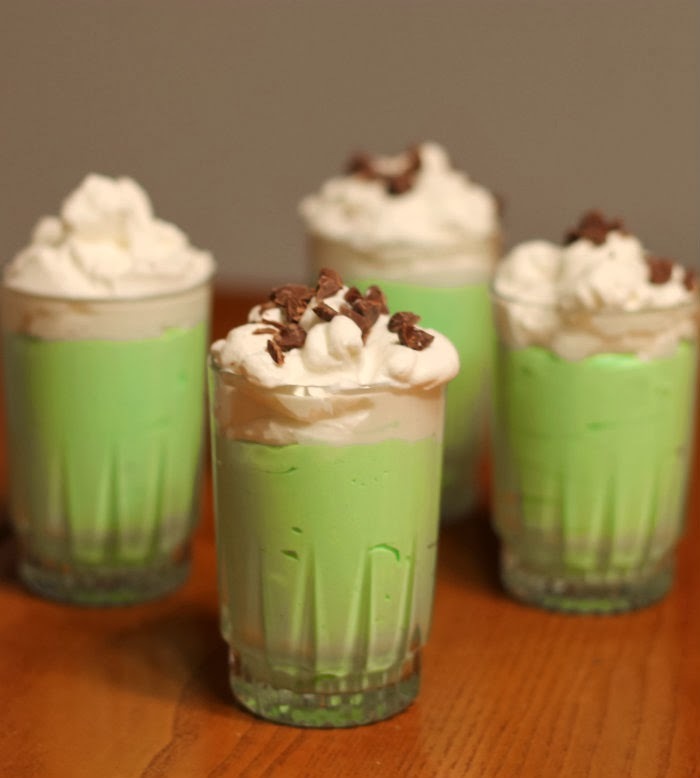 The next time I make them I will decrease the creme de menthe just a touch, but they sure brought back memories of when my mom served the Grasshopper for those special occasions. 1. Combine the pudding, milk, and creme de menthe and blend with an electric mixer just until it begins to thicken a little. 2. Take cool whip and fold into the pudding mixture. 3. Fill small glass until about 2/3 full top with sweetened whipped cream and chopped chocolate or whatever topping you so desire. 4. Refrigerate for about 1/2 hour to setup. 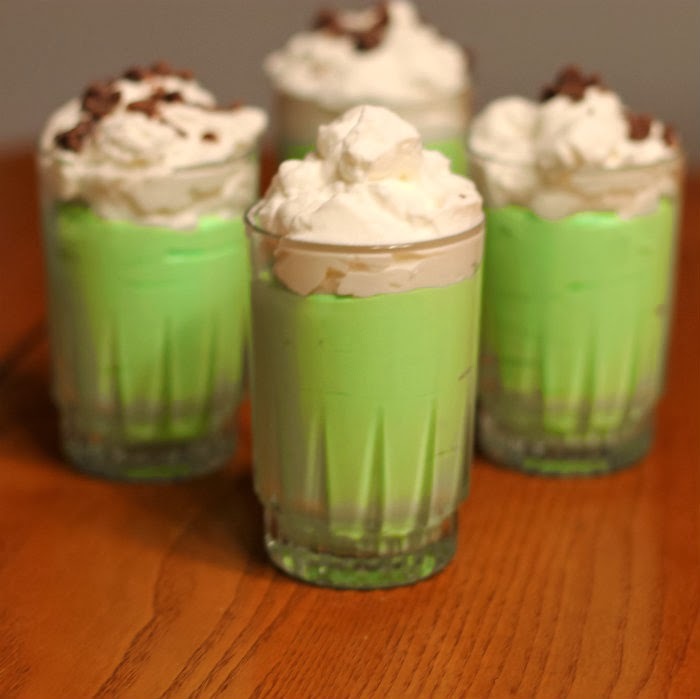 I LOVE creme de menthe….especially in dessert (rather than in an actual beverage). I would love to dig into one of these pudding cups! These are so bright and pretty! And irresistible looking too! I love all things mint and these look fun to eat. Could I use mint extract instead so they are kid friendly? thanks! Hi Andrea, to be honest, I have never made these with mint extract.